One vehicle, five orders - even in this seemingly simple situation, 120 different options are available to execute all orders. The complexity of the optimisation task increases rapidly as soon as more vehicles and orders are added, truck attributes and time restrictions should be considered, and different objectives have to be weighed up against each other. PTV xServer offers intelligent methods and algorithms that support you in solving even the most complex logistical challenges efficiently. And what’s more: PTV xServer is the most effective software for dynamic route optimisation worldwide. This means that reoccurring traffic patterns (e.g. rush hours) as well as predictable construction sites are already factored into the route planning. PTV xServer enables you to identify potential for improvement of routes that you execute regularly and increase transport efficiency. Consider traffic patterns as well as restrictions such as delivery windows and rush orders. Determine how to load your vehicles to save time during loading and unloading. Accidents, last-minute orders, cancellations: Intervene manually if plans change spontaneously. Calculate exact times of arrival and flexibly reschedule if delays occur. With PTV xServer you maximise the utilisation of your fleet and optimise the loading of your vehicles. PTV xServer supports you in combining pick-ups and deliveries in a smart way, making maximum use of available loading meters and evenly utilising your vehicles. This increases the profitability of every journey and thereby of all your logistics processes. PTV xServer offers the knowledge of four decades of transport planning in a state-of-the-art software development kit (SDK). Flexible programming interfaces (APIs) enable the seamless integration of specific functionalities into your own system landscape. Full software solution instead of flexible software components? Are you rather interested in a complete solution for fleet planning and scheduling? 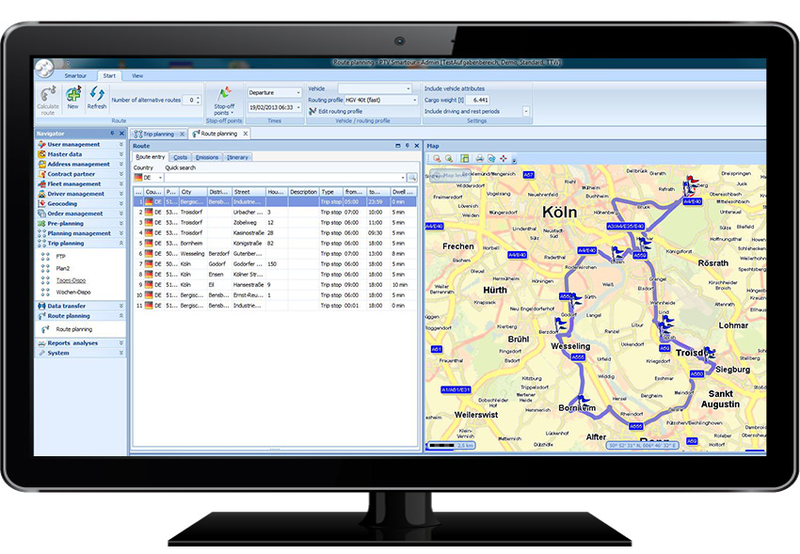 Why don't you have a look at our software solution PTV Route Optimiser. PTV Smartour enables you to plan tours quickly and efficiently, all while making optimum use of your resources.